If you are using a laptop, the Hibernate power option will usually appear when you click on the Power button on Start Menu. However, it’s not always there if you are on a desktop computer. This tutorial will show you how to enable the Hibernate button in Windows 10 Start Menu. If anyone or any website tells you that hibernate is already enabled by default, it’s just that you can’t see it, the truth is yes, hibernate is partially enabled since Windows 8. The fast startup you’ve been experiencing relies on the hibernation technology (but it means to shutdown your PC). However, it’s still not as efficient as the full hibernate feature which you can close and resume all your works exactly the way they were. The Hibernate option is hidden by default in most desktop computer running Windows 10. We will have to manually re-enable it to have it shown in the power menu again. Follow the steps below to add the Hibernate option to the power menu where we usually click on for Shutdown, Restart or Sleep options. Click on Start menu. Type “control panel” and open it. Go to Hardware and Sound. 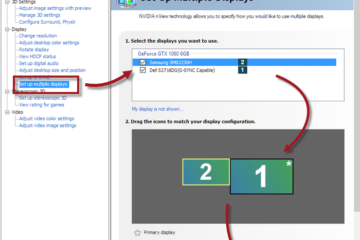 On the left panel of the window, select Choose what the power buttons do. Click on the “Change settings that are currently unavailable” link. If windows prompt for permission, click OK. 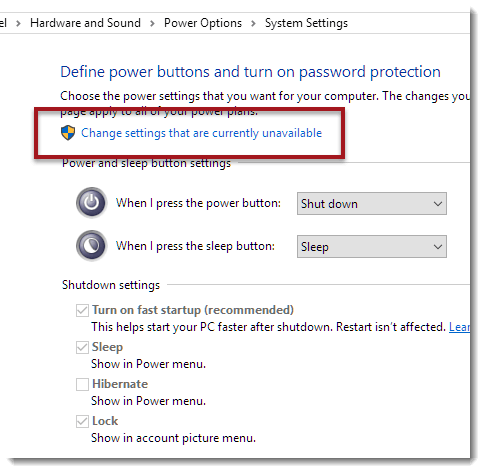 Under Shutdown settings, tick the checkbox labelled Hibernate – show in power menu. Now, go to your start menu’s power option. The Hibernate option should be there now. If you no longer need the button and want to hide it from the power button’s menu, simply follow the steps above until step 6. Remove the checkbox labelled Hibernate to hide it away from the power menu. If the hibernate option is nowhere to be found in the system settings, or if it’s just went missing or vanish after several usage, try the following workaround. Open command prompt by going to the start menu, type “cmd”, right click it and run as admin. In the command prompt, type powercfg /h on and press Enter. 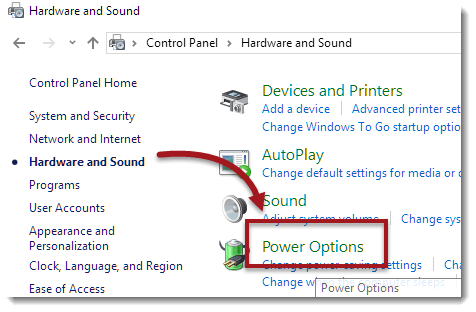 The hibernate option should show up again as a checkbox in the power settings window. To revert the change, type powercfg /h off. If you’re still having issue with the hibernate power option, drop us a comment below and we’ll try to help. 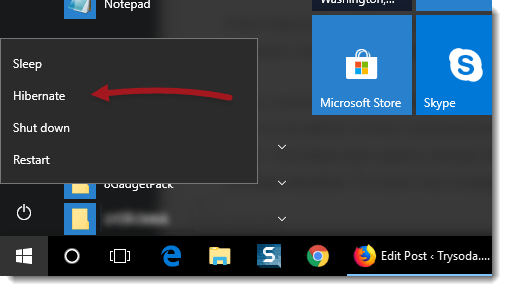 Description for sharing: If the hibernate option is missing, gone or cannot be found from the power options in start menu, here's how to enable hibernate in Windows 10 start menu for your laptop or desktop computer.